Have you ever felt like you just aren't sure of the answers, and you might not know enough, and worried, "someone's going to find out, I know nothing!" 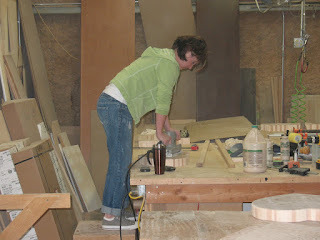 I have felt that way in the cabinetry world because there is so much to learn, there are so many new questions that need answering, and I never payed attention to my dad when I was growing up. Since the last year has gone by it seems I have more confidence in what I have learned in the business and how I can help others. I didn't have this confidence before and it feels really good. It makes me so happy! I was out to a house measuring a for a kitchen remodel and the couple were really cute and a little more advanced in age. The husband asked me oh so slyly, "so..............how long have you been in the business?" (I should have told him it was my first day). After I answered, "18 years" his jaw went to the floor. I mean really, who wants to trust an 24 year old (is what he thought), to rip out your kitchen cabinets, build new ones, make the new ones fit, and it all looks better than before. If I was advanced in age I wouldn't want to trust a young whipper snapper to put a pool in my yard and expect it not to leak. I kind of have to slip in that my "15 year old in high school plays the trumpet" or "my 12 year old is in 7th grade. Can you believe the kids these days?" Moving on, trust is a huge thing in the remodeling world, especially when you are dealing with one of the more important rooms in your house, the kitchen. I have learned to be extremely sensitive to others needs and questions, and I am just so excited that I can feel confident enough to answer questions and help. Nothing is better than being able to ease another's mind about your job and what you can do. So....all this to say, I am going to be 40 in 20 days and I'm really am going to enjoy these last days as 39. Afterwards I can focus on being 40 and all it entails. Hopefully more remodeling, more learning about cabinets, and more of Mr. Know-it-All!